The last minute compromise by the two main parties enabled the enactment of the 19th Amendment to the Constitution after a marathon session, which lasted from 9.30 am till 11.00 p.m. in Parliament on Tuesday. It was probably the busiest day in contemporary history of politics in Sri Lanka because the political party leaders and their representatives, including President Maithripala Sirisena and Prime Minister Ranil Wickremesinghe, were occupied with meetings, one after another to strike a consensus and compromise through consultations with each other on the clauses of the Constitutional Bill. By Monday when the debate got underway in the House, the parties agreed in principle on most of the clauses. But, there were issues concerning two contentious clauses regarding the composition of the Constitutional Council and the requirement that the President should seek the advice of the Prime Minister when appointing Cabinet Ministers. In the original draft presented by the government, the Constitutional Council, which nominates members to the Independent Commissions, was meant to comprise the Speaker, the Prime Minister and the Opposition Leader by virtue of their office. Besides, five members were to be appointed from outside the Parliament by the Prime Minister and the Opposition Leader in consultation with each other. The remaining two persons of the ten-member body were to be nominated by the President and the minority parties respectively. But, Mahajana Eksath Peramuna (MEP) Leader Dinesh Gunawardena, backed by a section of Sri Lanka Freedom Party (SLFP), Democratic Left Alliance (DLF) and National Freedom Front (NFF), insisted that the Constitutional Council should be a Parliamentary body in complete, leaving no major role in it for anyone from outside. This became the most contentious clause as the parties found it hard to reach a point of understanding on the composition of the Constitutional Council. The two sides failed to reach any compromise even by 5.00 p.m. on Tuesday. At the party leaders’ meeting chaired by the President and the Prime Minister, the participants traded serious arguments with the government advocating a role for members from civil society and the opposition hardening its position that only Parliamentarians should hold office in it. In fact, it was argued at one point that the UNP included such a clause or a provision to ensure a role for civil society activists in the Constitutional Council, enabling them to play a role in good governance. At one point, Leader of the House Lakshman Kiriella, who is also the Plantation Minister, said the Opposition was trying to let down the civil society movements that played a pivotal role for the election of a new President. However, DLF Leader Vasudeva Nanayakkara hit out at Mr. Kiriella that the supremacy of Parliament could not be compromised at any cost to suit the interests of what he called ‘neo-liberal and re-colonialist forces’, by bringing outsiders. After a lot of huff and puff over the matter, no finality was reached on the matter even by 4.30 p.m. and therefore some party leaders like Dinesh Gunawardena and Prof. G.L. Peiris even concluded that it was absurd for them to engage in an exercise that was heading nowhere. At one point, they even left Committee Room 2 of the Parliamentary complex, where the meeting was conducted. A little later, the meeting resumed business in a last ditch attempt to strike a compromise, and this time, it bore some results as the government gave in finally. Only at that moment, some certainty emerged on the possibility of enacting the 19th Amendment, the foremost election pledge of President Sirisena and the political forces that backed him. Upon relentless agitation by the Opposition legislators, it has now been agreed that the Constitutional Council should consist of seven Parliamentarians including the Speaker, the Prime Minister and the Opposition Leader. For the remaining four slots meant for MPs, one is to be nominated by the President and another by the minority parties. The other two MPs will be nominated by the Prime Minister and the Opposition Leader. Still, there are three remaining in the ten-member Constitutional Council that has the sole authority to make appointments to the Independent Commissions. Outsiders can be picked for these posts, but by Parliament through the High Post Committee. Now, it is a Parliamentary body. Finally, the Opposition had its way. Likewise, during the pre-enactment review, the Opposition managed to prevail upon the government to replace the clause that the President should obtain the advice of the Prime Minister in the appointment of Cabinet Ministers. This clause was altered along with the lines ‘In consultation with the Prime Minister, where he considers such consultation necessary’ as an amendment by the Opposition. Initially, the Business Committee of Parliament had scheduled the vote on the bill at 6.00 p.m. on the day. But, the session was extended by one hour to find time for consultations outside the chamber on the issues where the two sides took a long time to see eye to eye. Finally, at seven in the evening, the vote after the Second Reading was taken up. As many as 215 MPs raised their hands in support of the bill in principle. There were seven absentees including MPs Basil Rajapaksa and Premalal Jayasekara currently held in remand custody. United People’s Freedom Alliance (UPFA) MP Sarath Weerasekara was the only MP to vote against it as, he believed, the new bill would compromise the interests of the majority community. 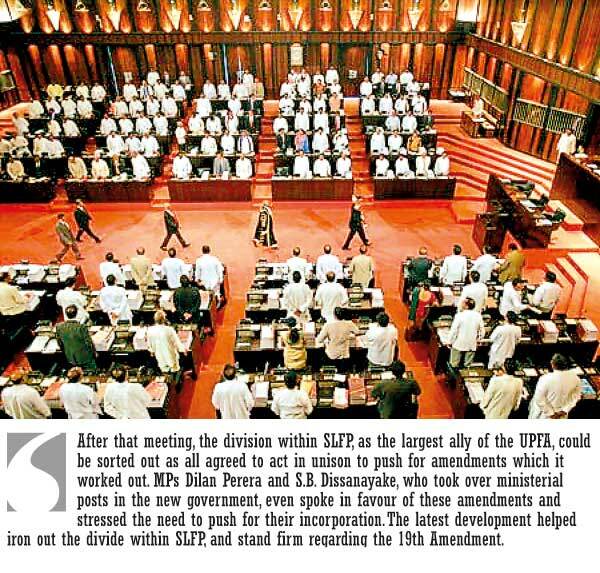 The passage of the bill, however, hit further snags during the Committee Stage as the Opposition party leaders, particularly Mr. Gunawardena, Mr. Nanayakkara and Lanka Samasamaja Party (LSSP) Leader Prof. Tissa Vitharana forcefully pushed for the incorporation of their provisions and the withdrawal of the provisions which they did not want. First, Mr. Gunawardena took the government to task over the unavailability of Sinhala and Tamil translations of the amendments drafted by the government at the latest stage. Speaker Chamal Rajapaksa had to suspend sittings for 15 minutes to arrange quick translations. “Don’t try to bulldoze your way in this manner! If you try it, we will also bulldoze our way out,” Mr. Gunawardena remarked after an argument with Mr. Kiriella in the House. Afterwards, the business resumed, and Justice Minister Wijeyadasa Rajapakshe proposed amendments on behalf of the government. The Opposition legislators, who keep a close tab on each amendment, rose on their feet whenever anything unacceptable to them was moved. Arguments and counter-arguments sometimes lasted for more than 30 minutes on a single point. Among such clauses that came under scrutiny, there was stiff objection to the clause that prevents MPs from seeking injunction orders either from the High Court or the Court of Appeal whenever they face action against them by their party authorities. They enjoy that legal right today when they are expelled from their parties in case of crossover and defying the party stands on key issues. The amendment, proposed by the government in this, provided for redress only from the Supreme Court. However, the Opposition was opposed to it tooth and nail. They wanted the status quo to remain in this exercise and cross talks ensued back and forth in the House. Finally, Mr. Gunawardena who stood firm in this case, decided to call for a division on the particular clause. No sooner had he announced his decision, than the government consented to withdraw the clause concerned to continue with the status quo. The Justice Minister said such a clause was absolutely necessary to maintain order and strength of all the parties. Yet, the Opposition critics argued otherwise saying the MPs should enjoy their right to act according to their conscience in matters of national importance, albeit the stance and policies of their parties. Also, Prof. Vitharana brought in a new amendment insisting that the Independent Commissions such as the Police Service Commission, Public Service Commission, Bribery Commission and the University Grants Commission should be held answerable to Parliament. He was backed by other party leaders such as Mr. Nanayakkara and Mr. Gunawardena. Finally, the government conceded to accommodate it. The Committee Stage deliberations continued till 11.00 p.m. when it was put to the final vote. Altogether, 212 MPs voted for it. Three more MPs who were present during the Second Reading vote had left during the committee stage. Former Prime Ministers D.M. Jayaratne and Ratnasiri Wickramanayake were among them. Despite criticism, the 19th Amendment, enacted in this manner, contains provisions for much desired political reforms in the country. The establishment of Independent Commissions and holding the Executive Presidency answerable to the Legislature and the Judiciary are reforms that nobody can oppose. In that light, the country gained something from this exercise. President Maitripala Sirisena, in his attempt to strike unity in the United People’s Freedom Alliance (UPFA), had a separate meeting with its Parliamentary Group on Tuesday morning at the Parliamentary complex. At the meeting, a controversial circular issued under the Police Ordinance was brought to the notice of the President. That is the circular issued by the Inspector General of Police establishing the Financial Crimes Investigation Division. The President also asked for a copy of it. Consequently, Prof. Peiris kept it in the hands of the President. After a glance, the President said he was totally in the dark about it. He even vowed to take it up at the Cabinet meeting. The other members such as Bandula Gunawardane also spoke in connection with this circular. Backbenchers of both sides remained uncertain whether the necessary number of votes could be mustered for the enactment of the 19th Amendment. Whenever they encountered each other on the corridors, they started frivolous talks. One such causal discussion took place among UNP MPs Palitha Range Bandara, P. Harrison, Dilip Wedaarachchi, and Kabir Hasheem. The argument was that they should seek a fresh mandate from the people to enact all these reforms at the next election if the Opposition scuttles the process. More than serious constitutional reforms, most of these members were preoccupied with work at their electorates ahead of the general election. Mr. Wedaarachchi, in this case, was distraught over the appointment of MP Mahinda Amaraweera of the SLFP as the Fisheries Minister. Mr. Wedaarachchi was the State Minister in charge of fisheries and the appointment of Mr. Weerawansa who is also from the same electoral district of Hambantota came as a shock for him. While the Committee Stage vote dragged on for hours, some MPs had little work to do. So, they did a lot of fun filled activities to spend their time. Among them, Minister Reginald Cooray drew the picture of MP Tissa Karalliayadda on a piece of paper and passed it to other colleagues to have a look for fun.